Modern style kitchen furniture. Customer from Wakefield, West Yorkshire. 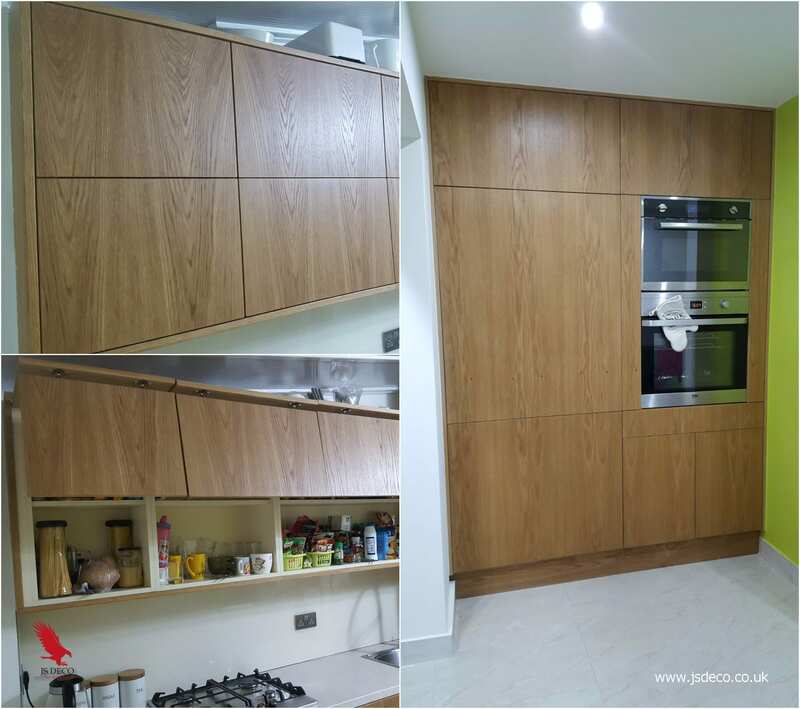 We just finished a project of the high spec modern kitchen. This time customer had an extension which has to be adopted as a kitchen, there was also a niche with boiler and washing machine to cover. The whole project is bespoke and made in our workshop. 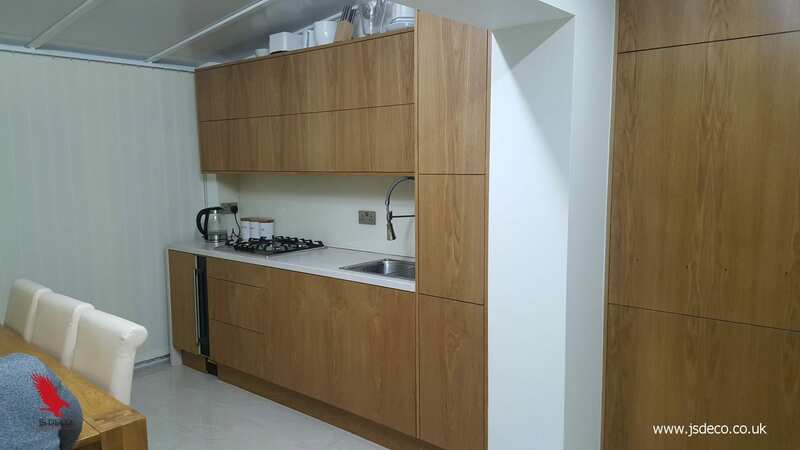 The core of the kitchen made in 18mm laminated chipboard finished with PVC edge. 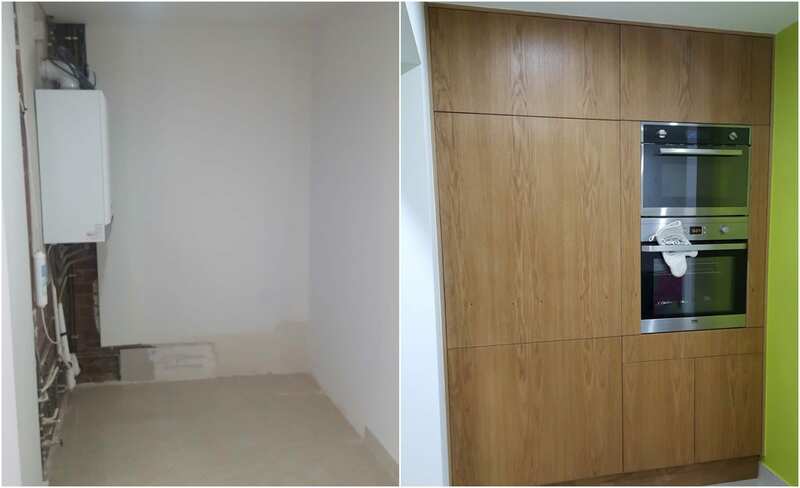 All visible elements of furniture are made of MDF covered in natural oak veneer and varnished to a satin finish and have been cut with care for the match the grain patern on the whole project. This technique needs an accuracy and is time-consuming but results in a very attractive and unique visual effect. There is no two the same kitchens made that way. The other important advantage of this kind of finish is ecology. Production of this doors does not consume so much material as solid wood doors. In the same time is saving trees but still give a possibility to enjoy the natural and warm beauty of wood. In the matter of technical part. A modern and very efficient solution is used in top units equipped with Blum push to open bifold doors opening system. The base units are made on the tip-on / soft close Blum runner system. List of appliances used in this kitchen contains an integrated wine cooler, integrated dishwasher, gas hob, integrated oven and steam cooker. All in a brushed stainless steel finish. Older PostClassic style kitchen, modern ideas. 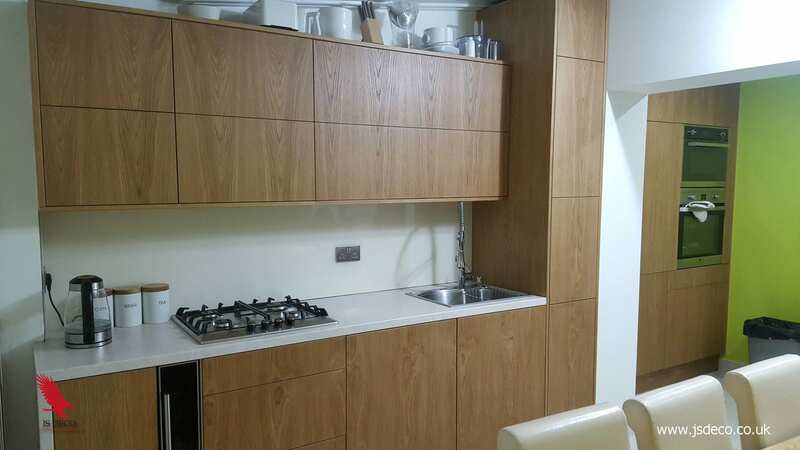 Newer PostAnother 24 kitchens installed for SIG / Urban Splash.